except 1 and 2, which have their own (10 µm) scale bar. Fig. 1, 2, 6, 7. Medullary shells of Heliodiscus spp. with (rudimentary) pieces of cortical shell attached (all in lateral view). In figs. 1 and 6 (probably juveniles of Heliodiscus amphidiscus) the walls of the conical are almost parallel; in figs. 2 and 7 (probably Heliodiscus asteriscus), they are strongly curved. Both appear to have an excentric internal structure within the (ovoid) microsphere, resulting in monopolar symmetry. BSS 28B(VII/1596 and 1597); IOW 188(F); BSS 26B(F) EF Z45. Figs. 3-5. Heliodiscus amphidiscus. Spines may stout (fig. 4) or slender and delicate (fig. 3), at times branching (fig. 5). BSS 28B(VII/1598), 26B(F) EF B46 and 28B(VII/1579). Figs. 8-10. 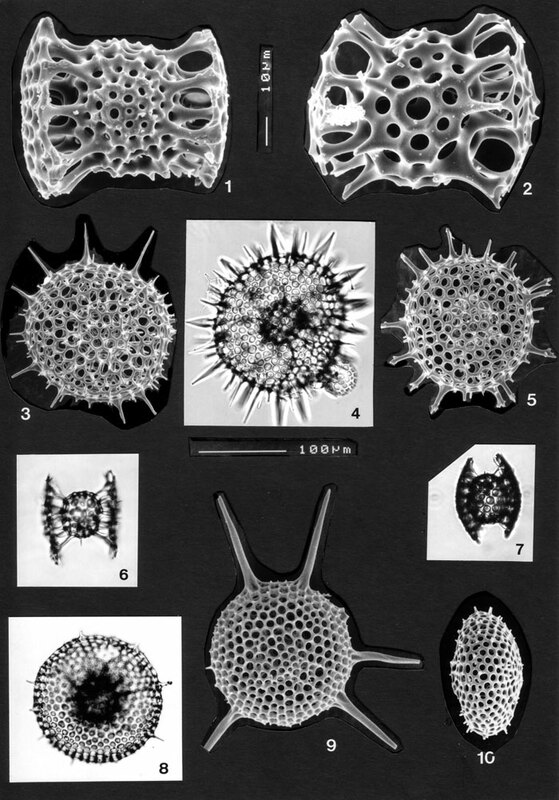 Juveniles of Heliodiscus asteriscus (cp. with Sethodiscus macrococcus Haeckel and H. solaster Haeckel). IOW 146(F) and 2x BSS 28B(II).